PARIS (AP) — In a story Jan. 22 about Paris Fashion Week, The Associated Press misidentified the singer of the arias played at the Givenchy show as Maria Callas. The singer was Montserrat Caballe. 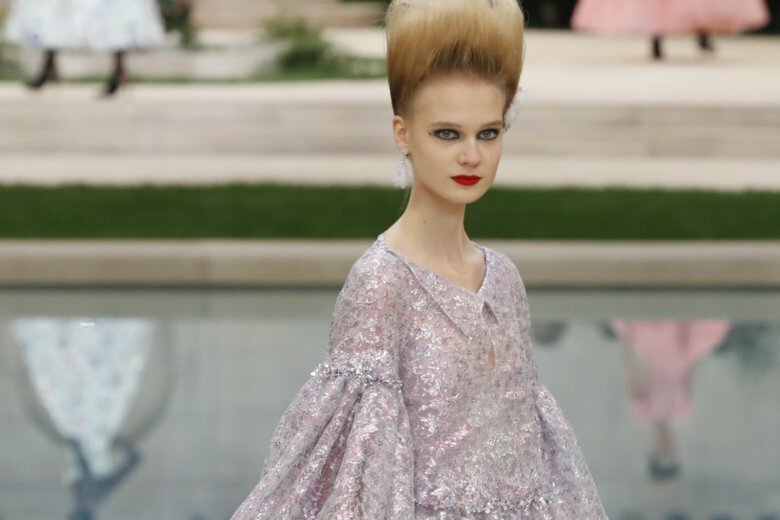 PARIS (AP) — It’s snowing in Paris, but not at Chanel, which showcased 18th-century-inspired couture that frothed inside a sunlit Italian villa. For once, Karl Lagerfeld didn’t take his usual bow — the house said because the octogenarian designer was fatigued. Waight Keller’s couture danced from the delicate white feathers on a pearly strong-shouldered bustier to the humor of a black couture rucksack with batwing ruffles. The artistry of a multicolor-fringe clown-like creation with a Maleficent ruff led on to the imagination of a black embellished “jelly fish” dress with cinched waist and pink tulle skirt that spilled ribbons like tentacles. It’s the beginning of something special in Paris fashion. It’s the first time in recent memory that Lagerfeld, who has designed for the Parisian stalwart since 1983 and was a contemporary of the late Yves Saint Laurent, has not been physically present to receive applause at the end of a show. In a statement, Chanel said “for the traditional greeting at the end of the show, Mr. Lagerfeld, artistic director of Chanel, who was feeling tired” asked Viard “to represent him” — without providing any further details. A gentle geometry defined Chanel’s summer silhouette on Tuesday — one that riffed on the decor’s impressive architecture. The set this season featured a shimmering Italian Chanel villa center-stage, with steps that led the gaze down to myriad real palm trees, grass and a rectangular pool. Shivering and dripping guests were momentarily transported away from Paris’ subzero temperatures and snow to enjoy a moment of summer bliss, and the clothes’ pastel hues glistened in floodlights evoking warm sunshine. Slits in the skirt and long vertical lines in the center of the body were a central theme in this season’s feminine 62-look collection. A silvery skirt-suit, a house signature, opened the show with a slit running down the leg to the season’s new shoe: a backless pointed heel with a full-fronted panel. Regal full-skirts that caught director Sofia Coppola’s eye fared less well as the display progressed, with the weight of the tiered silk fabric making the designs look somewhat limp. The slit also morphed into an exploration of unfurling styles in some jackets that seemed to open up like the scented flowers in the villa’s verdant gardens. “Marie Antoinette” director Coppola was among VIP guests invited to admire Villa Chanel’s 18th-century full skirted designs. “I did think of Marie Antoinette when I saw the pink dresses at the end. They were beautiful,” she told AP. “(It evoked) a bygone era to see the dresses with the feathers up close,” she added. There is something timeless about Giorgio Armani’s couture. The timelessness is not just apparent in the eternal elegance of his styles, which on Tuesday showed off the fashion icon’s famed cutting skills through tailored jackets. (Armani cut his teeth in menswear tailoring). But it’s also apparent in the way the couturier evokes an imagined reality. The Armani Prive collections thus throw to the wind any real interest in evoking a spring-summer season, for instance, or a trend or any up-to-the-minute fad. At the second of Tuesday’s double-shows, alongside Chanel, Armani Prive showcased a series of archetypically couture looks in the exclusive Hotel d’Evreux in the Place Vendome that made statements of their own with shimmer and bold color. French designer Alexis Mabille’s signature bow made a recurrent appearance in varying sizes, styles and colors at his demure couture display Tuesday. Going retro, the bow was conjured up as a ’70s jabot collar on a Farrah Fawcett-like blue silk column dress. But the piece de resistance was the detail’s cameo as an oversized bust detailing, giving the feeling that the model in a red tulle gown could be unwrapped.